Researchers from UC Berkeley, Florida International University (FIU) and the Georgia Institute of Technology demonstrated for the first time the presence of magnetic properties in graphene nanostructures at room temperature. This could lead towards Spintronics applications. To achieve this they functionalized the graphene with nitrophenyl. 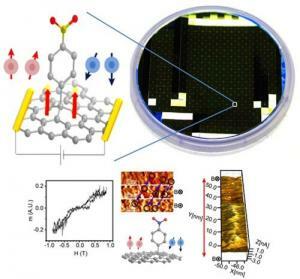 The researchers thus confirmed the presence of magnetic order in nanoparticle-functionalized graphene. The graphene was epitaxially grown at Georgia Tech, chemically functionalized at UC Riverside and studied at FIU and UC Berkeley.